Creative's Sound BlasterX G6 is here to improve your audio. Creative is a brand best known for its range of audio products and has been producing sound cards and external devices for decades. 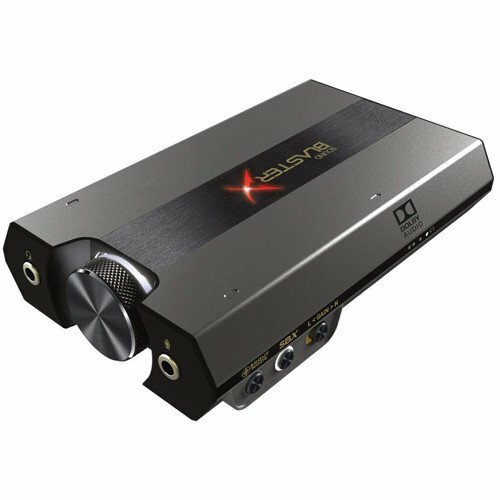 The latest iteration in the Sound BlasterX series is the G6, replacing the well-received G5. It's essentially a digital-to-analog converter (DAC) and amplifier in a single unit. Is it worth the asking price and does it really make a notable difference? Bottom line: If you're sick and tired of your motherboard audio, grab the Creative Sound BlasterX G6.. Supports consoles, PC and other devices. The software could be improved. Power adapter not included for consoles. I used to be in the "soundcards don't improve your audio enough to warrant the additional cost" camp. But several years ago I made the switch to dedicated audio on my main desktop and boy was I wrong. The difference between integrated audio on a motherboard and a dedicated DAC and amplifier is very noticeable indeed. The G6 from Creative continues to improve things further. Sporting a 130dB 32bit/384kHz DAC, this impressive piece of kit can boost and refine audio input for a superior experience on the other end. Throw in support for Dolby Digital, PC, consoles and even the Nintendo Switch, and you've got a winner. The Creative Sound BlasterX G6 transforms the way you experience audio on PC and console. Creative is also keen to point out Xamp, which is just the company's fancy branding for amplifying both audio channels individually for headphones, instead of doing both with single amplification. The important question is: does this all work? Yes, regardless as to what headphones you use. What makes the G6 so good is how you can pair it with some $150 cups or a cheap $20 headset from Amazon and you'll be able to tell a difference when migrating from onboard audio on your PC. Having the ability to hook up your console and the Nintendo Switch makes this a must-have for anyone looking to — quite literally — boost their audio experience. In my testing, I found the G6 to even surpass the audio output quality of the ASUS X470-F, which isn't a cheap AMD Ryzen motherboard. You can immediately notice the improvement with a more balanced audio, better bass, and treble. I also found I could get away with lower volume settings, especially with music playback and certain genres without sacrificing overall quality. Games I tested the G6 with included Zelda: Breath of the Wild, PUBG, Star Control: Origins, The Witcher 3, Skyrim: Special Edition, and Forza. Finally, I could better tell where the noise (footsteps and general movement) was being produced in PUBG without having to crank up the volume, even if the game is a little buggy when it comes to audio. An odd omission with the G6 is a power adapter. In order to use this device with a console, you need some extra juice for the external unit to function. This is easily rectified by using a generic USB adapter that can supply enough power, but it's strange that Creative does not include such an accessory with the product. The software is a little lacking in the user-friendliness department. It could certainly do with a makeover to make it easier to use, especially for those who haven't used such a device before. Other than that, I didn't encounter anything that would put me off buying the G6. Should you buy the Creative Sound BlasterX G6? You should buy the G6 if you rely on motherboard audio processing and own a console you also wish to hook up. The added benefit of using a single DAC and amplifier unit for multiple inputs means you can easily switch between them and use your favorite headphones. For $150, it may be out of reach for the budget conscious, but is well worth the price.